‘MISSING’ PYRAMIDS AT GIZA DISCOVERED… ON AN OLD MAP! 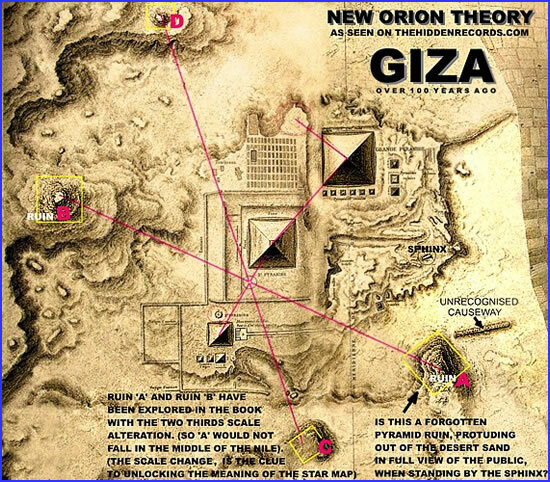 A NEW recently revealed pyramid/star correlation theory for Giza can now be proven conclusively. Wayne Herschel - the proponent of the new hypothesis - has just found the remaining missing pyramids that will make his theory conclusive. His ‘missing pyramid hypothesis’ was first mentioned in his book, ‘The Hidden Records’, which has recently been published. 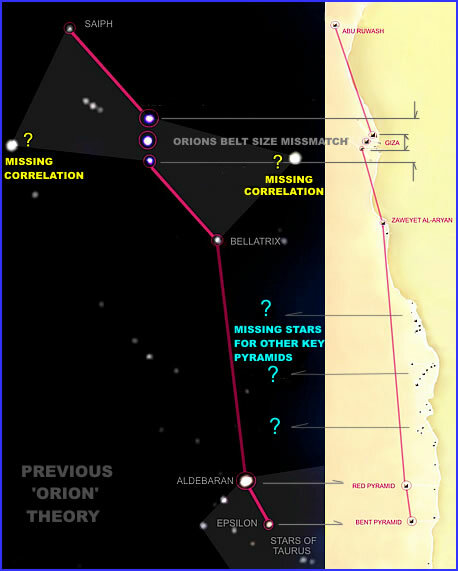 The author made this invaluable breakthrough while setting out to prove author Robert Bauval’s much acclaimed theory that the three pyramids of Giza correlate with Orion’s ‘belt’. However, he proposes an entirely new star map interpretation to Bauval’s, using a completely new layout scale for the Orion constellation as a whole (which leads to the inclusion of the all important Taurus constellation alongside it). This new scale interpretation displays some very ingenious mathematical adjustments (explored in the book) that must have been made intentionally by the pyramid builders, and speaks of an incredibly advanced very early civilisation. Not only does this new scale provide the answer for so many of the objections scholars have come up with… BUT IT HAS BECOME INSTRUMENTAL IN CONFIRMING WHAT APPEAR TO BE FOUR UNRECOGNISED PYRAMID RUINS AT GIZA! Discovering these elusive ‘ruins’ has also enabled the author to crack a decipherable message, which is key to unlocking the prime reason as to why the ancients built such an elaborate pyramid star map in the first place! Wayne, with many years experience in astronomy and familiarity with star maps, could see why astronomers were not completely convinced with the model Bauval proposed for his overall pyramid/star correlations (see below). 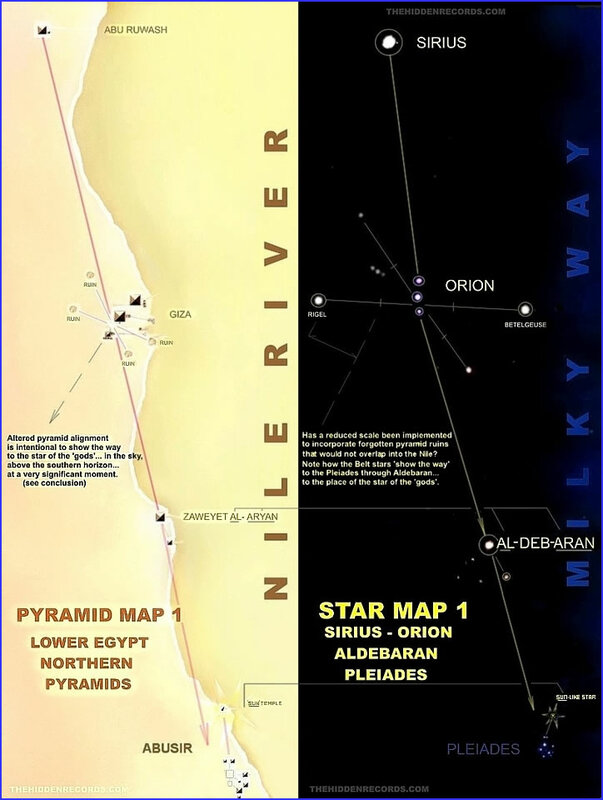 This star map identified two pyramids at quite a distance from Giza (Abu Rawash in the north and Zaweyet Al Aryan in the south) to represent two of the Orion periphery stars (Saiph and Bellatrix). Although there seemed to be fairly similar distances and angles between the pyramids and the stars they were supposed to represent, one could not help observing that Bauval had no counterparts for the two brightest periphery stars of Orion. (See yellow question marks in the map below). But the biggest doubt in this model was the difference in scale when it came to comparing the size of the Orion’s ‘belt’ stars with the size of the three main pyramids at Giza. Academics have also recently pointed out that if the pyramids had been built to represent stars in a grand design so to speak, why would their builders not have included earlier pyramids - the pyramids at Saqqara and Abusir - as part of a star map? One has to query the inevitable here: What if there is a whole new interpretation that answers all these questions? And if so, would it reveal an age old secret behind the pyramids? It was this prime question that inspired Wayne Herschel to dig deeper. Given the huge distance between the Giza ‘belt’ pyramids and the closest pyramids neighbouring them (in the north Abu Rawash and in the south Zaweyet Al-Aryan), he could not help thinking that completely different stars were at play in this pyramid star map. What if two far more significant stars, namely Sirius and Aldebaran, were to fit here as the correct correlations for these two pyramids? After all, the ancient Egyptians revered Sirius as very important and the name given to the star Aldebaran was “Ad-Dab-aram”, which means “follower of the Pleiades”. (This is because if one were to follow one’s line of sight from Orion’s belt through Aldebaran, one’s eye would follow directly to the Pleiades in the night sky). Quite uncannily, the name even sounded like the pronunciation of the ancient pyramid name “Zaweyet Al-Aryan”. What if there was a connection here? And could it be that the Pleiades (part of the constellation Taurus) also somehow fitted into the picture? This could easily be tested and if it turned out to be right, the size of the Giza pyramids would most likely match the size of the three stars making up Orion’s ‘belt’… exactly! “Egypt is the image of the heavens… the whole Cosmos dwells here”. “Whole” being the operative word! This very conspicuous clue suggested to him that a much wider interpretation of stars in the night sky was at play and that in all likelihood a whole 360° revolution of the Milky Way (of which Orion and Taurus form a part) was being replicated in the pyramid star map of the ancients. It was a possibility that had been entirely overlooked by Egyptologists, and it would leave him no peace. He was determined to find out if there was an astronomical solution to the grand master plan that was apparently at work in how the ancients had laid out their pyramid field. To do this, he created a series of transparencies of the stars. 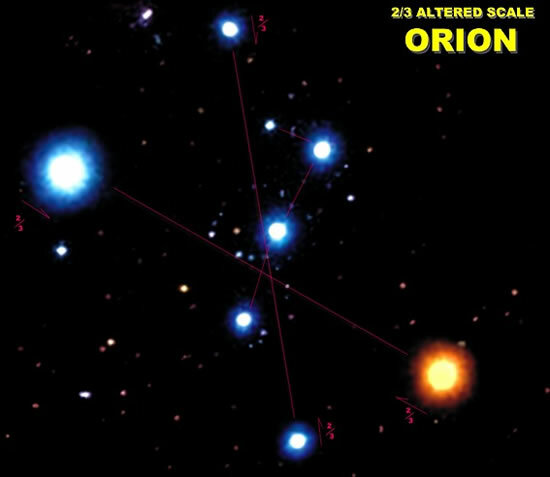 The astronomical scale was adjusted so that Orion’s ‘belt’ would coincide with the sizes the three main pyramids at Giza. The transparency was placed over one of the most credible ancient pyramid maps. The result was breathtaking. What emerged was a series of very accurate correlations for the most prominent stars in Taurus. (Orion is located alongside the sacred bull of the ancients…Taurus). 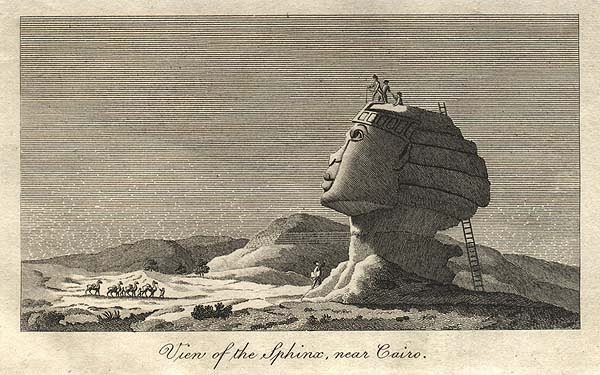 A ‘RUIN’ VISIBLE NEAR THE SPHINX… BUT HAS NOBODY NOTICED IT? Note how the middle area of the ‘ruin’ seems to have collapsed. The debris is literally the same size as the pyramid blocks at Giza. Is this ‘engineered’ bedrock that was once the base ruin of a pyramid, or are these real blocks? 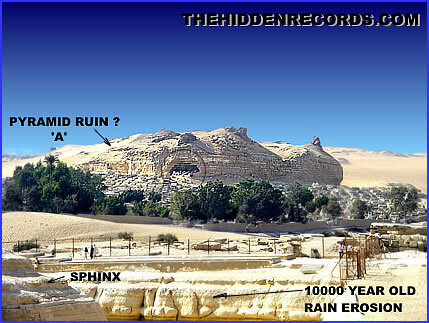 Note also the rear of the Sphinx (the vantage point from which the picture was taken) and the eroded walls that have been said to be over 10,000 years old, dating back to an epoch when rain fell in this area. This is when the author decided he needed an aerial image of Giza. There was only one option… an image from a hot air balloon, and that is exactly what happened. He recalls how frustrated he was with the result. The area had changed considerably over time with roads, a cemetery and building developments almost cancelling out what the area must have looked like in ancient times. But this would not deter him. What he did with the photograph was to remove all the anomalies that his research told him had been built in the last one thousand years or so. 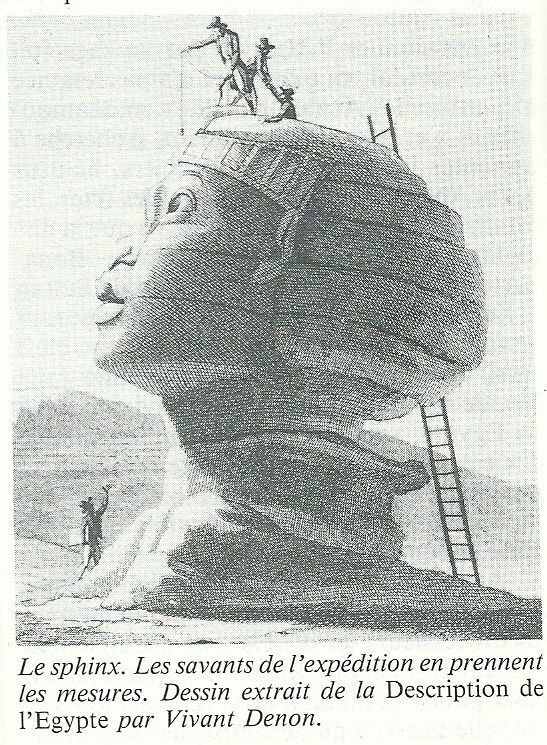 The processed image that resulted from his efforts was remarkable and it has been published in ‘The Hidden Records’ as the first colour overhead image of how Egypt once looked, at the time of Napoleon arriving in Egypt. The new image clarified that in all likelihood this was a pyramid ruin. This could be further confirmed by it aligning exactly with one of the Orion stars. WHAT ABOUT THE THREE OTHER MISSING PYRAMIDS? But what really had the author puzzled, was that this ‘ruin’ had been built two thirds closer to the three main Giza pyramids, when compared to the distances of the star in question in relation to the ‘belt’ stars. The author’s book, ‘The Hidden Records’, goes to great lengths to reason this peculiarity, and comes up with some very thought provoking explanations, which once again goes to show how ingenious the pyramid builders really were. But what about the three other outer pyramids that would complete the star map? What could be lurking under the desert sand? The search was on once again… but this time for an antique map of Giza by one of the earliest cartographers. As already mentioned earlier, even Taurus (ostensibly the most important to the ancients according to all their texts) fits into this new model? It too has its pyramid counterparts on the ground! Not only did the author’s transparency test reveal such correlations, but it also included numerous others beyond Taurus and Orion… including the oldest Egyptian pyramids found at Memphis. In an infinitely important breakthrough, it turns out that the star map that emerged from Wayne Herschel’s transparency experiment included very accurately all the brightest stars alongside the Milky Way in one complete 360° revolution. This is exactly what the ancient Egyptian text of Thoth claimed. 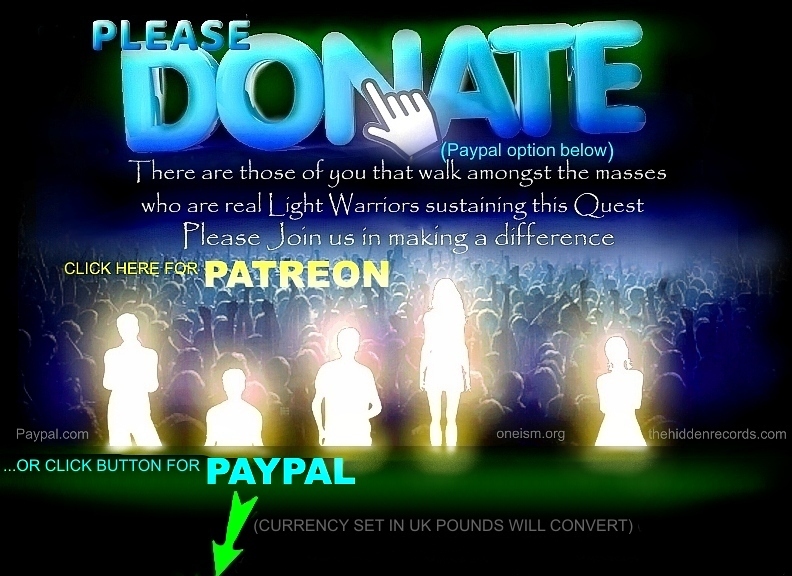 Here is the final NEWLY ADJUSTED image in support of his theory. Notice how his correlations differ from the model proposed by Robert Bauval, as seen on the top of this web page. Wayne has overcome all the previous objections proposed by scholars, all of which are detailed in the book. After all… pyramids must be built on bedrock and not sand and the code of mathematics seems to take slight precedence over precise stellar positions. All of this is on debate in the book. The reasons for the altered scales and why Giza is aligned the way it is, is meticulously unravelled in the book. Also how the Da Vinci codex fits into the Giza layout… where the ‘fingerprint of humanity’ literally shows the way to a measurable nearby Sun-like star in the sky… the star that Egypt and many other ancient civilisations all claimed to be the star… of the ‘gods’! (This is the prime theme of the book). This pattern is also matched on the ground… with a correlating ‘Sun-like’ temple… the ‘Sun-like’ star temple of ‘Ra’. But what about the missing pyramids at Saqqara, and Dashour that have not yet been included in the new star map theory? Are there accurate star correlations for these? The answer is yes again… there are accurate correlations with the brightest stars that remain in completing one full side of the Milky Way! A very logical yet simple message can be decoded in this star map. It isolates one pyramid/star correlation that qualifies as the proverbial ‘x’ on the star map. See the remainder of the Egyptian star map that is shown only in thumbnail size. 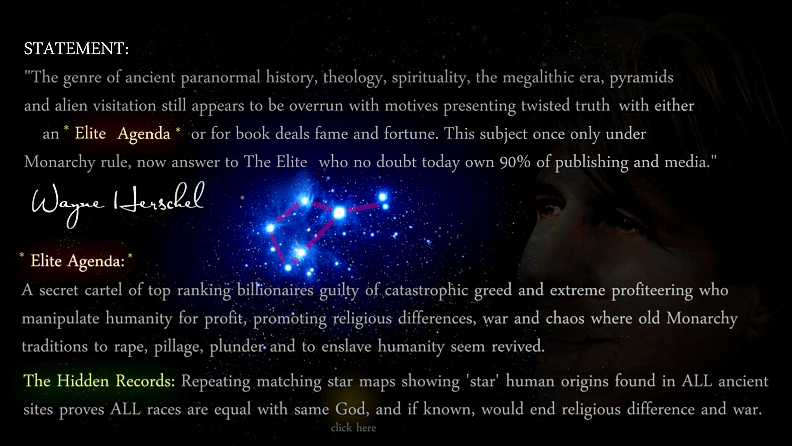 (Click on the Star Map web page link shown earlier). 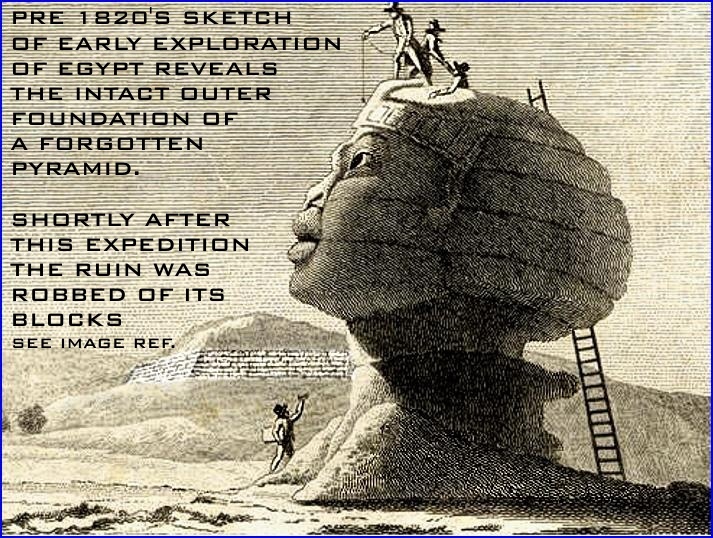 The full size is depicted in the book with some interesting proof why the bent pyramid… is bent! Click here to see the thumbnail preview of the balance of the star map evidence. The whole of Lower Egypt represents one complete revolution of one side of the Milky Way… all for the purpose of one reason, and one reason only. This new pyramid star map interpretation has been aired recently on a South African television documentary and various radio interviews and the latest findings on this news release have been sent to universities all over the world to evaluate. Scholars are not prepared to comment yet, but undoubtedly will feel compelled to make a statement in the near future. Any research website, magazine or news media wanting to use this general text and images as an article, can contact the author at thrbooks@gmail.com to obtain authorisation for official usage. Conditions for use thereof will include mention of the author, the book title and the website (either a direct link or HTML address if the article is not on the web.